The All Rounder Tool Belt is designed to suit any trade or purpose. 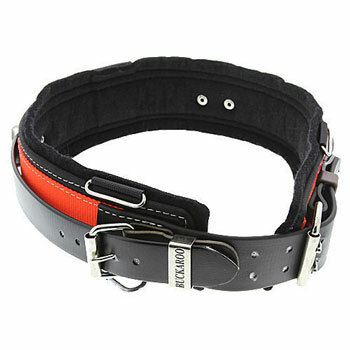 The upper belt is fully adjustable to support tool pouches or frogs and fastens with a heavy duty buckle. All Buckaroo belts feature copolymer coated webbing upper belt strapping - a high performance material that has replaced leather in the equestrian industry due to its unique properties. A wholly Australian invention, and made in Australia copolymer is non-toxic and will not stretch, crack, tear or harden if exposed to moisture, unlike leather. A combination of materials used on our belts allows them to last under the harsh conditions in which they are used. Sizes range from 32inch up to 46inch. Larger sizes can be made on request.